Whether you already have a fence that needs replacing or no fence at all, there are no many reasons to add a new fence to your home in 2019! Now is an excellent time to consider which home improvements to invest in for the year ahead. Much like a project inside of your home, your fence is an essential aspect of your property to consider for improvements as well. Whether you already have a fence that needs replacing or no fence at all, there are so many reasons to add a new fence to your home in 2019. As you are deliberating, consider the many reasons why a fence is an excellent investment for your home this year. By establishing a well-constructed fence around your property, you are also adding a safety feature to those who enjoy spending time in your outdoor space. Protect your children and pets from coming into contact with unknown people, animals, and cars that may be driving down your street with a high-quality fence. Establish a boundary around your property with a new fence. Not only will your fence add security and visual appeal, but it will also clearly distinguish your property from the properties of your surrounding neighbors. A new fence is also an excellent tool for creating privacy for your outdoor space as you entertain or enjoy time in your yard. Not only will a fence provide you with privacy from people, animals, and noises beyond your yard, but it will also help to contain any sound on your property within your outdoor space. Your new fence will also add an element of visual appeal to your home exterior, as a classic wood or white fence is the perfect accent to your landscape. Particularly for homeowners who plan to sell their homes in the future, a fence can become an essential element of your outdoor space by creating the first impression for a potential buyer. As a barrier between the outside and your property, your fence also becomes an added security measure for your home. 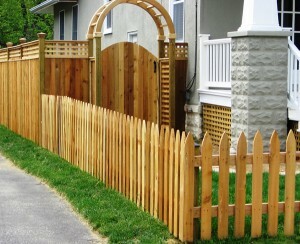 A fence will help to reduce the risk of break-ins, if not prevent them entirely. Your new fence will also send a message to any potential intruders that you are serious about your home security as well. Call Mid-Atlantic Deck & Fence For Your New Fence in 2019! Mid-Atlantic Deck & Fence has almost 30 years of experience in building beautiful custom fences, gazebos, screened-in porches, and decks throughout the state of Maryland. We have the expertise to design your dream fence or custom deck and have it installed in a headache-free process. Give us a call at 1-800-833-9310 or visit us online for a quote today! We offer many different styles of fencing and decking in addition to custom options designed specifically to suit your preferences and tastes. To see examples of our work and get more tips on how to choose the right decking for your family, follow us on Facebook, Twitter, Houzz, Pinterest, Google+, YouTube, and LinkedIn.